Since weekends are pretty much made for shopping (and hell yes, it's the weekend! 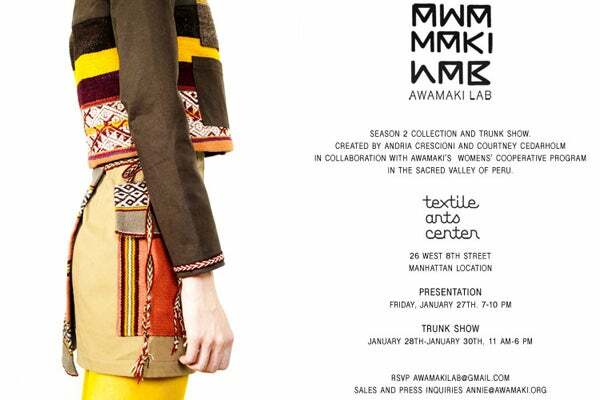 ), we've got your itinerary already planned: Namely, you have to hit up the Awamaki Lab trunk show, which benefits a totally awesome cause. Andria Crescioni, the winner of last year's Parsons Loomstate project, went to Peru after graduation to work with the Awamaki Lab, a non-profit which helps indigenous Quechua weavers get their goods more easily into the market, and ultimately to ensure that their ancient craft survives. Crescioni and fellow Parsons alumni, Courtney Cedarholm, created a capsule collection from these Quechua textiles, and are ready to present — and sell — their collection to the world. Today through Monday, you can take a look at their handiwork and buy some unique and colorful sweaters, dresses, and accessories which, in turn, help support the non-profit and sustain the weavers' business. Not bad for a little (much needed) retail therapy, huh? When: Today through Monday, January 30, from 11 a.m. to 6 p.m.
Where: Textile Art Center, 26 West 8th Street (between Fifth and Sixth avenues); 646-225-6554.